I am currently planning and designing an artists’ book, using content from/inspired by interviews I did with people about the sculpture ‘Atom Body Was Light’ by Liliane Lijn. 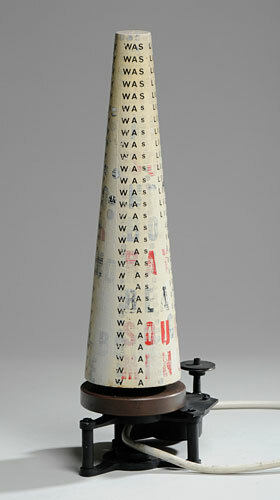 In a way, I am using Lijn’s sculpture as a case study in reading an artwork, how do we make meaning from it? So I have been asking myself, could I have done the project with any art work? The answer is ‘possibly’, but Lijn’s sculpture was of interest to me because of it’s use of language and its direct reference to the body in its title and the words depicted on the sculpture. Within my work I am always returning to language and embodiment (people as both physical and symbolic beings). To be straightforward about it, I think art is an example of an activity that encompasses and conveys the richness of human experience. It is somatic and it is intellectual. It is, in a direct utilitarian sense, sometimes pointless or its point is not obvious, but I don’t want to live in a world where everything is immediately functional (and this is a world that we are tending towards). So I suppose, without realising it initially, I did have an agenda for this project and I wanted to see whether other people felt the same as me. I also wanted to find out if people, like artworks, feel a pressure to be useful. Do we measure ourselves by what we ‘contribute’? Related to the question of whether I could have used any artwork as a starting point, I have also been asking myself how tied to ‘Atom Body Was Light’ the content should be. Because of the nature of my questions, lot of the things I am writing reference the sculpture, it’s appearance or what it reminds people of. I like how some of the content might give a picture of the sculpture in its absence. But I also don’t want it to be a book ‘about’ that particular sculpture. I have other content which is more to do with people’s perceptions of their roles and am trying to find a way that the book doesn’t seem split in two, between content about the artwork on one side and content about the people’s lives on the other.